Skunk2 Ultra Series Valves - Pann Auto Performance - San Diego largest aftermarket automotive performance parts - What do you drive? Skunk2 Ultra Series valves are our premium line valves manufactured from HNV3 martensitic steel (IN) and EV8 austenitic steel (EX) one-piece forgings. These characteristics of the austenitic nickel based alloy enable high resistance to oxidation and corrosion and are designed for engines that output extremely high temperatures. 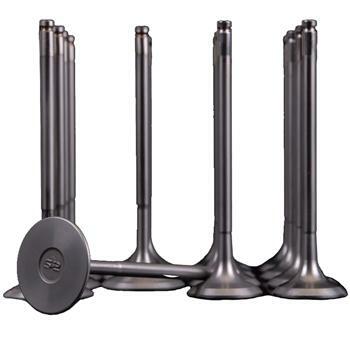 Ultra Series Valves are heat-treated using a proprietary process for extraordinary strength and durability. Chromium Nitride coating is deposited on each valve using physical vapor deposition (PVD) process. This coating significantly improves wear and heat resistance, creating conditions for more durability and long term usage. Chromium Nitride coating is a remarkable solution as it improves the friction coefficient between the valve’s stem and valve guide; a necessity for engine components that demand resistance to high heat level environments. Skunk2 designs, develops, and tests its entire valvetrain lineup in-house to ensure superior quality and maximum performance gains. During development, each valvetrain component is tested both on the dyno and the road. Manufactured from the best materials available in a state-of-the-art manufacturing environment ensure that Skunk2 valvetrain components provide exceptional performance, reliability, and quality. These components remain standard-issue on each Skunk2 vehicle that we build and support.